What’s in a word? In Malaysia, plenty: a single word in the wrong hands apparently has the power to convert, subvert and threaten an entire nation! Malaysia must be the only country in the world where the government has taken it upon itself to decide which words Christians can or cannot use. 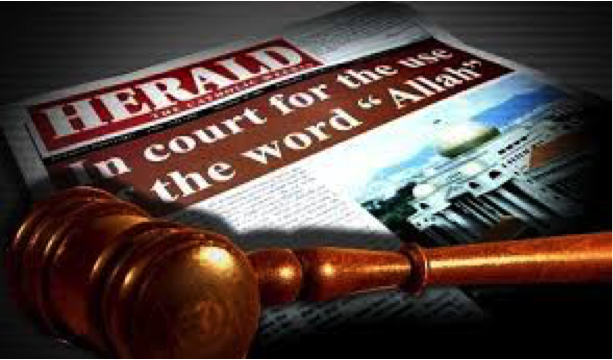 Earlier this week, a five-member bench of the Federal Court dismissed an application by the Roman Catholic Archbishop to appeal a ban on the use of the word “Allah” in its weekly newsletter, The Herald. 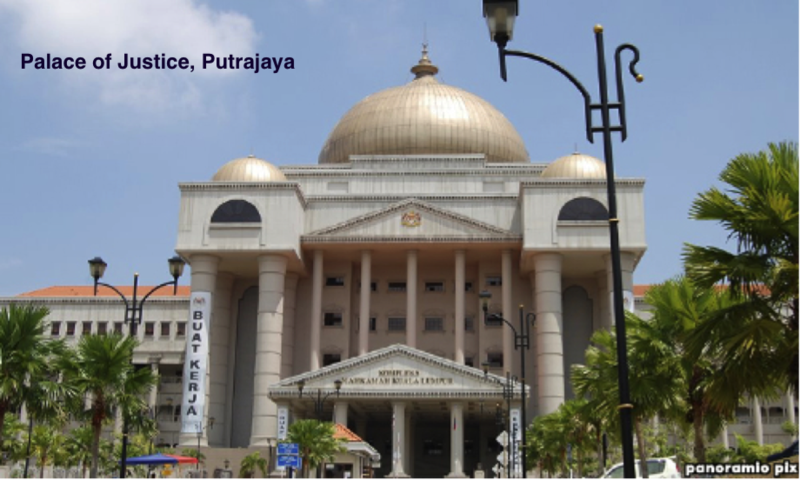 The Court’s ruling means that Christians in Malaysia have lost the right to a word widely used for “God” in local translations of the Bible, in hymns and in many Christian vernacular publications. It is a setback for religious freedom and an indication of the extent to which religion has been politicized in Malaysia by the ruling party. This idiocy began in 2007 when the Home Ministry proscribed the Catholic newspaper, The Herald, from using the A-word in one of its issues. The government argued that the use of the word “Allah” by Christians would create confusion among Muslims, lead them to convert to Christianity and threaten the peace and security of the nation. In the meantime, extremist groups like ISMA and PERKASA (photo right) have stepped up their rhetoric against minorities with a PERKASA leader even threatening to burn bibles. The conclusions of both the Home Ministry and the National Council for Islamic Religious Affairs are, of course, absurd and irrational given that the word Allah has been used by Malaysian Christians for more than 300 years and by Arabic-speaking Christians since well before the advent of Islam itself. Indeed, archaeologists have found an Arabic-language Christian Bible (the Mt Sinai Arabic Codex 151), that is nearly 1,300 years old, in which God is called “Allah.” The word is also used by Sikhs and Hindus. As well, nowhere else in the Muslim world – not in Saudi Arabia, not in Egypt, not in Iran, not in Pakistan, not in Indonesia – has the word “Allah” been deemed exclusive to Islam. 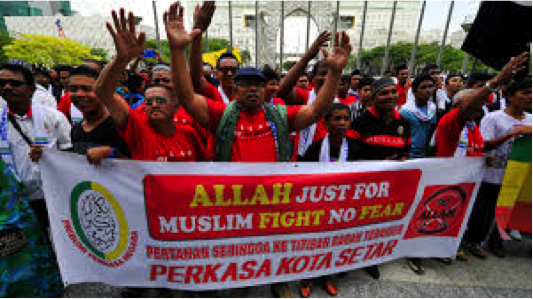 Why the government of Malaysia would think that only Malaysian Muslims would be confused by Christians using the word or that it would threaten national security is a real mystery. Malaysia’s Christian leaders have rightly been alarmed by the court’s decision. Islamic scholars, both at home and abroad, have also, and quite rightly, panned the decision as completely illogical and having more to do with local politics than with religion. In New York, the Chairman of the Al-Hikmah mosque wondered who gave Muslims exclusive rights to the word while well-known American Muslim scholar, Reza Aslan, said he was mystified by the ruling since Al-Ilah is not the personal name of God but simply a translation of the word God. Even the United Nations weighed in on the Allah issue when its Special Rapporteur on freedom of religion and belief, Heiner Bielefeldt, called on the Malaysian government to reverse its decision to ban the Catholic weekly Herald from using the word. In recent years, Christians, who make up about 10% of the population, have had to endure rising intolerance and, at times, outright hostility – churches have been firebombed; services and meetings have been disrupted; the Bible Society of Malaysia has been raided; bibles, hymn books and CDs have been confiscated and sometimes desecrated; and Christians demonized. The latest ruling will add yet another obstacle to freedom of worship in Malaysia. It is incumbent on Prime Minister Najib Tun Razak, who so eloquently champions moderation abroad, to practice what he preaches at home by defending the constitutional guarantees of freedom of worship for all Malaysians. And he should start by rescinding the ludicrous ban on the A-word and reining in overzealous Islamic officials. the nail on the head. The problem is something which too few men and women are speaking intelligently about.